Q is a state-of-the-art, 12,500 sq. 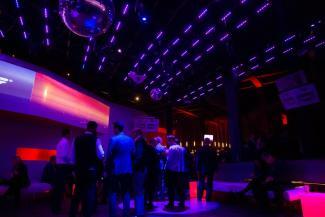 ft. multilevel lounge and nightclub located in Seattle’s vibrant Capitol Hill neighborhood. Setting a new standard for excellence by returning to the fundamentals of what makes a nightclub experience great, Q focuses on innovative interior design, groundbreaking sound and lighting, exceptional service, and our twist on specialty drinks and cocktails, including the club’s own signature line of infused and flavored vodkas. Q is open four days a week, serving both as a lounge on weekdays and as a nightclub on weekends. No matter whether you are seeking a relaxed atmosphere after work or a fun night of dancing, you will be able find it at Q. The space is designed by Bohlin Cywinski Jackson, the AIA award-winning architects behind such projects as the iconic Apple Cube on New York’s Fifth Avenue, Pixar Studios Headquarters, and Seattle City Hall, to name a few. In addition, Q incorporates world-class audio-visual components as part of its overall design, providing the most memorable experience for our patrons possible. These include a sound system by Funktion One from England, designed by Sound Investment AV, and a state of the art lighting design by Steve Lieberman of the award-winning SJ Lighting in Los Angeles.